16 August 2017–Congratulations to Ms. Caroline Greene! She has been selected as this years’ recipient of S³s Corporate Matching AAAA Scholarship. This is a 2 year scholarship providing $1,000 each year . Ms. Greene is the daughter of Thomas Greene (Retired MAJ) who has been an S³ Simulations Training Analyst since 2010. Caroline is from Orem, Utah and will be attending Brigham Young University. The 2017 AAAA Scholarship Selection Committee along with volunteers from the AAAA National Executive Board, the AAAASFI Board of Governors and Chapter Officers performed an outstanding job of evaluating and nominating over 400 applicants in this 2017 competition. There were 287 awards made for a total of $473,000.00. S³ is proud to support this program. S3 is a long serving and active participant of the AAAA Scholarship Program. 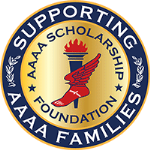 S3 supports AAAA scholarship activities at the annual AAAA National gatherings and participating in the scholarship selection process. S3 employees donate their personal time, and corporate S3 donates resources to further AAAA scholarship awards. Once again, congratulations to Ms. Greene and good luck as she pursues her undergraduate degree at Brigham Young University.